I haven’t been travelling as much as I would like to lately *sigh* – so I am going to start a throwback series to my previous travels that I had posted on my previous blog. I hope you guys enjoy it. 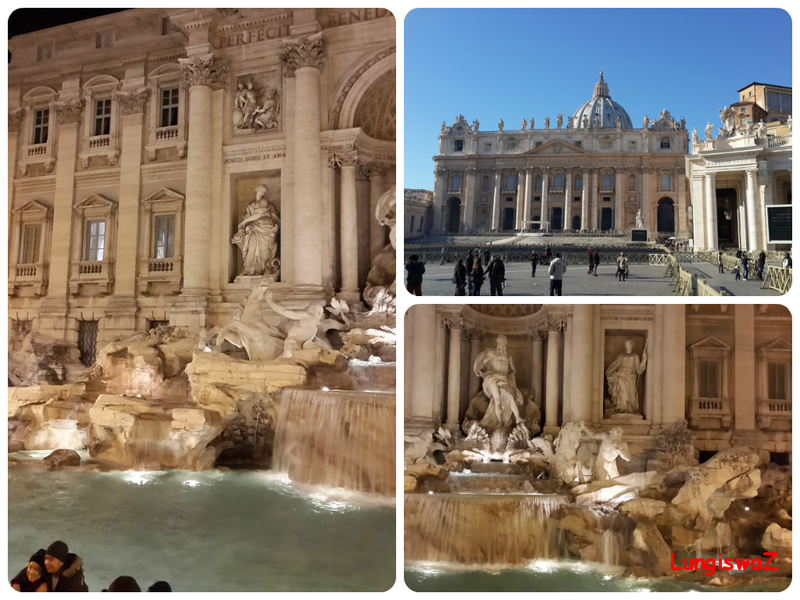 First up, is a post I wrote in December 2013 when I traveled to Rome, Italy for my 28th birthday. I had been living in Switzerland at the time, so I traveled from there and not from South Africa.I spent 3 days in the the beautiful eternal city, Rome. First of all, let me say that if you do not like old buildings and history, this city is not your ideal destination. Day 1 I flew from Geneva to Rome’s Fiumicino airport on a Thursday afternoon arriving just after 17:00, the biggest pity about European winter is that the sun sets so early, by 16:00 it is already starting to get dark. At the airport I took a shuttle into the city, but I could not really see much because of the aforementioned darkness. I arrived at Rome’s main train station Termini, which was soooo busy, oh my gosh, there were people everywhere and it is such a hub of activity! I had directions for the place where I was staying, so I followed those and made my way to the metro boarding place, and that was more full than the upper floors of Termini. I missed the one metro because there were just so many people squeezed in that I didn’t see how I could fit, I then realised that pushing myself + suitcase in was my only option – but I was just so traumatised by that experience. After 3 stops I arrived at San Giovanni stop and made my way out, and it was raining (rain+darkness+I am not familiar with my surroundings = disaster), after walking in the wrong direction a few times, I finally found the hostel and I couldn’t have been happier! That night I didn’t do much because I was dead tired, I went to have dinner (spaghetti carbonara) at a restaurant nearby and I hit the sack afterwards. Day 2 (my birthday)I woke up to the sunniest, clearest day in Rome, the weather was just tres perfect! I decided to visit the Colosseum and other historical sites. Luckily my hostel was close to the Colosseum (1.8km, it’s so funny how my definition of ‘close’ has changed in the past months) so I decided to walk and enjoy the beautiful day. I got lost again (what is wrong with me? ), but it is all because I was marvelling at the different buildings in my hood, but I eventually found my way to the Colosseum and it was magical and very busy, every 10 steps there is someone trying to sell you something Rome related (yawn). I lined up to get my ticket and I decided to also sign up for a guided tour, which was a cool experience because we got to learn more about the history behind the Colosseum and the gladiator fighting and the Roman Empire. I highly recommend the guided tour because without it, you would end up just walking around aimlessly which is not ideal. After the Colosseum, I went for a quick lunch and headed to the shopping street of Rome, Via del Corso; I took this shady little bus that didn`t have announcements for the next stops so I was basically relying on luck to get me to the right place. Luckily the bus passed by the Spanish Steps – which I recognised from the pictures, so I just got off at the stop and went to the top of the steps to soak up the sun with all the other Romans (is that the right term?). I eventually found the shopping street and of course stopped over at my favourite H&M and Tally Weijl. After walking around, I bought some gelato to finish up my day. Upon arriving at the hostel, I was greeted by a gift from my friends – a bottle of champagne – it was so perfect because it was totally unexpected like totally, I was so shocked and happy that they found a way to be with me on my birthday, and the card was written in Zulu :), that was the icing on the cake. For dinner, I went to a restaurant with some new found friends for pasta, wine and some dessert. Day 3 This was my last full day in Rome, I had a few things on my to do list which were to go to the Vatican Museum and to go to Trevi Fountain, I didn’t want to jam pack my day too much. So, the day before I booked tickets for the Vatican Museum online (for an extra 4 euros) because I was going on a Saturday and apparently lines can get cray, this was beneficial as well because I could get to the Vatican at any time and not try wake up extra early. While walking towards the Vatican I got lost again, but this time it was the best thing that could have happened to me because I ended up at St Peter’s Basillica. Seriously, nothing prepares you for the sight of this magnificent church, it is too gorgeous. I eventually made my way to the Vatican Museum, and just like at the Colosseum, there are people everywhere trying to sell you something and trying to get you to sign up for their guided tours – it is just exhausting. I arrived at the Vatican Museum and there was no line, like none, I was inside in less than 5 minutes (so much for pre-booking). Honestly, I am so overs old school museums with their paintings and statues, I feel like once you have seen one statue or painting, you have seen them all, I much rather prefer modern and interactive museums, but it’s not really possible to overhaul the Vatican Museum is it now? So if I hate old school museums, why was I there?…to see the Sistine Chapel of course, so I basically ignored every other exhibition and beelined my way to Michaelangelo’s masterpiece – it took me a good 15 minutes to get there, this museum is huge! Of course the chapel was packed to the rafters and there were two priests (pastors?) on the stage constantly telling us to keep quiet and not to take any pictures or video, the way people weren’t respecting both these rules, chit chatting amongst themselves and blatantly taking photos tsk tsk tsk. I found myself a seat and I just marveled at the ceiling, it is truly the most beautiful thing I have ever seen, I probable spent a good 30 minutes just gazing *sigh*. I had a late lunch (gnocchi, wine, apple pie) at a restaurant in Travestere and made my way to the Trevi fountain, it too like all the other sites in Rome was packed with people and informal traders *such a recurring theme*. It is truly beautiful though and rather peaceful, I could’ve sat and listened to the sound of the water for the whole night. I threw a coin in the fountain and made a wish, I’m hoping the amount you throw in isn’t directly proportional to the likelihood of your wish coming true, because I threw in 5 euro cents :). I had a quick supper (pizza and coke) and made my way back to the hostel to pack. Day 4 Whose bright idea was it to have flights at 9:15? because this meant for me waking up at 6am to make it to the airport. One of the girls I had met also had a flight around the same time as me, so I had someone to go the airport with, and just as well because Termini station at 6:30 was so dodge, drunk people were all over the show, I was so glad to have someone with me. The airport shuttle was about 20 minutes late and the employees of the company couldn’t have been more chilled (gotta love the Italians), luckily the driver drove like the wind and I made it in time for my flight to Geneva. I said goodbye to the beautiful city of Rome and promised to be back and I was thankful for spending my 28th birthday in such a beautiful place! Awwwww I loved Rome! I felt like i was transported back in time when i was there, the buildings are just magnificent! Did you go to other cities in italy? lol! you made me laugh Becca. Yep, they really are just steps. I’ve been to Venice as well but before this Rome trip. Wow Lungi i would love to travel the world one day and its so nice to see the world through the eyes of those who have been around it..p.s love your website/blog! Thanks Doreen! I enjoy writing them too because it takes me back to the time I was there.